In an effort for City of Houston (COH) buyers to be introduced to a wide variety of small, minority and women owned vendors, the COH Office of Business Opportunity is hosting the Fourth Annual Meet the Buyer Purchasing Forum. The forum will be held on Tuesday, December 11, 2012, 9 a.m. – noon at the George R. Brown Convention Center, Grand Ballroom A, 1001 Avenida De Las Americas, Houston 77010. 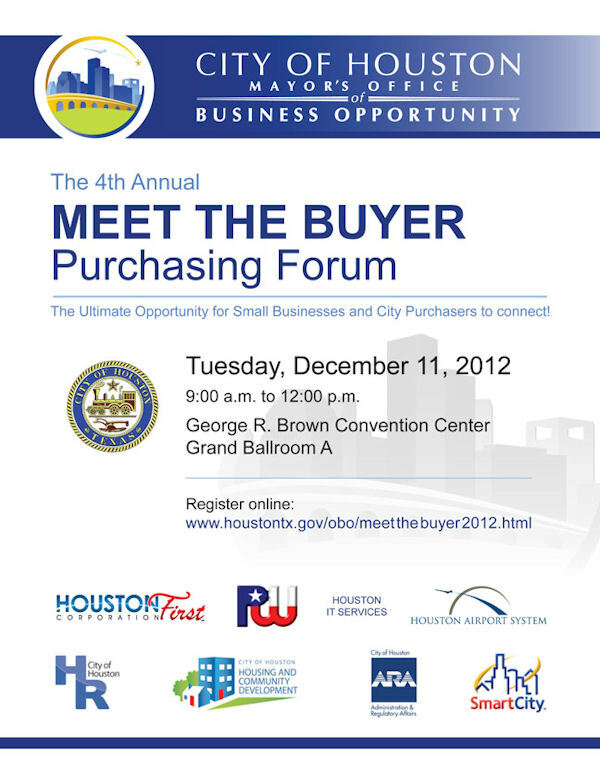 You can register for the forum online at www.houstontx.gov/obo/meetthebuyer2012.html. On-site registration the day of the event will also be available. For questions contact Roger Harris at roger.harris@houstontx.gov or 832.393.0623. To learn more about the Office of Business Opportunity, visit www.houstontx.gov/obo/index.html. NOTE: info from CitizensNet enewsletter.